Diary of a Miner: This land is riddled with portals! "Sam Latens, "117" and "4L"... Three seemingly random pieces of information, on three separate pieces of paper, found in three separate chests! Obviously this was a clue, designed to confuse whoever found one or all parts of the message! I stared at the pieces of paper in utter confusion for some time, trying to work out a meaning from them, but nothing came to mind. 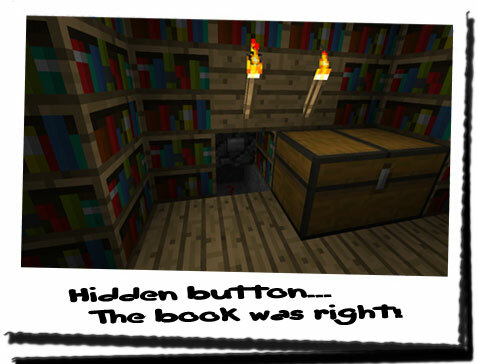 I kept thinking back to the the skeleton back in the passage, with bullet holes sprayed around! I suppose it solved the mystery of the disappearance of Jonas McElderry! Whoever had killed him was obviously searching for the same thing I was! I couldn't think of anything else that would hold such value... Despite the current circumstances, a relieving thought came to mind: whoever had came to take the stone obviously hadn't found it! If they had, then 1, there would be signs of a disturbance in this room, and 2, I wouldn't have found these clue pieces! It was incredibly unlikely, next to impossible, for them to find the clue pieces, work out the puzzle, and then replace everything back to it's original position! I tried to think what significance these clue pieces could have; they didn't form a sentence, as I was hoping. 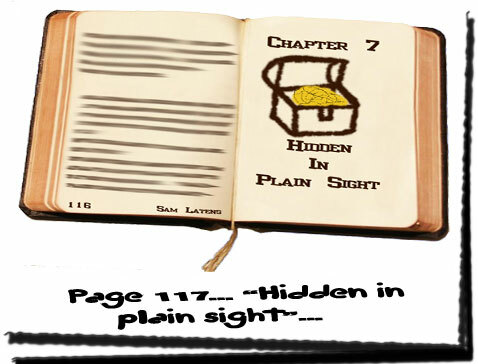 The only useful piece of information was the name, "Sam Latens", printed on the paper in the same ink and style as the two other clues. The numbers could refer to anything, but the name... Then it hit me... I had been so stupid! I was in a library! Where else would a seemingly random name make sense, than in a library! The name must refer to an author, or character in a book, somewhere on the shelves! But with so many books, finding it would take ages! I looked back at the other two pieces: "117" and "4L"... At a guess, the "117" could be a page number, but the "4L" made no sense at all... The other two clues presumably narrowed the search down to a single page in a single book, but this number meant nothing! It wasn't a page or chapter number, it was unlikely to be a title... Then another wave of brilliance hit me! A catalogue number! In a library, to find a book, you referenced the name of the book, the author, and the shelf! The "4L" must refer to a shelf... I looked around, but none of the shelves had numbers on... What did "4L" stand for then...? On a random guess, I stood in the doorway and looked to the left. I then counted up to four, stepping to the right as I did. I stopped in front of the fourth bookshelf on the left hand side and searched the top shelf; there were no books with the author "Sam Latens", and my heart sank... Maybe I was on the wrong path... For consistency's sake, I continued down to the centre shelf, and to my surprise, there, on the last book, was one named "A step too far..." with the author "Sam Latens"! I grabbed it from the shelf, and skipped ahead to page 117, hoping to find a loose page or piece of paper... What I saw was more than i could have hoped for, and I think I knew where the stone was! On the page was the start of a new chapter, "Chapter 7", with an image of a chest full of gold, and the title "Hidden in plain sight"! Immediately, I bent down towards the chest on the left-side wall and dragged it to the left... Nothing... I went across to the chest opposite the hidden shelf, and dragged it to the right... There, just behind the chest was a notch in the wall with a stone button, just about visible! "When close to a portal, the stone is said to glow a bright yellow, once again the closer you are, the brighter the stone gets." Looking back at the stone, it was glowing bright yellow! There was a portal nearby... There had to be! I picked it up and held it outstretched from me, worried it might explode or begin to burn through my hand. But it just sat there as a cold stone does! I left the room as it was and turned to the shelf that had slid to one side after I stepped onto a pressure pad on the other side. Looking down, I couldn't see anything hidden in the wooden boards of the floor, but I had been fooled twice before. Stepping forward, I wasn't surprised to see the wooden shelves slide to one side, as they had before. Quickly, I bounded through to the other side before it snapped shut! 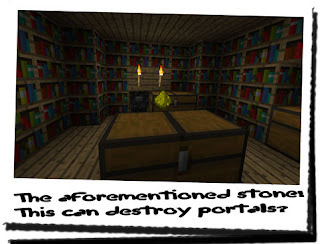 Looking back at the shelf, I was impressed; this Jonas had defended the stone with his life and his brilliant mechanical talents, regardless whether he understood what he had found! I passed the skeleton on the way back to the house, pausing a moment to honour him... He had done every miner proud! His talents and bravery may have just saved every miner in Minecraftia! I got to the wooden slats creating a drawbridge over the lava pit, and with a newfound bravery and energy, I ran across them! Getting to the other side with ease, I continued back up ladder and through the small slab that had slid aside. The secrecy of this place had to be retained, and so I pushed the button hidden in the wall, thankful to see the slabs slide back into place. With the stone still in hand, I ventured outside the house, in search of the active portal nearby! As I left the house and followed the path North, I noticed the yellow light begin to dim... Turning back to the South, I followed the cobblestone path that went behind the house, the yellow stone getting brighter and brighter! Eventually, I came to a small hole in the ground, with a series of cobble steps put in place. 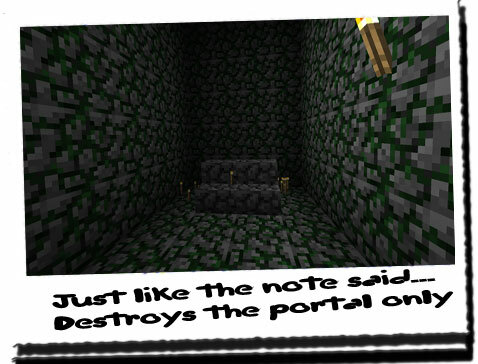 This must have been where Jonas had set up his mine! 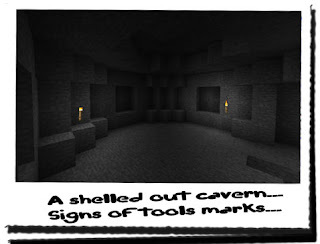 Going further down, I noticed that the whole place was brightly illuminated with torches, and there were tool markings everywhere! Soon, I came to a small open cavern which was fully illuminated, with tool markings on all of the walls, even the ceiling! This was definitely Jonas' mine! Continuing further, I noticed that Jonas had stuck very rigidly to the miners way of digging. The shaft was dug out very accurately, and brightly illuminated, with a few small tunnels leading off in different directions. Soon, I began to notice the stone begin to dim again, and stopping I managed to trace the real path back a few metres to a shaft that seemed much more natural. As I continued, the light got brighter and the walls became more and more rough. Eventually the light became so bright, it was painful to look at it! I knew I was close! Turning around another corner and descending a few cobble steps and passing over a few mushrooms, I noticed an all too familiar sight! The mossy cobblestone walls that stood before me had been present in other areas with portals, including the temple! Continuing forwards, I began to hear the familiar echoes of the portal that lay just inside the mossy chamber! Finding a doorway, I stepped inside, the portal standing before me, with the iridescent purple rift glittering and sparkling like fairy lights! 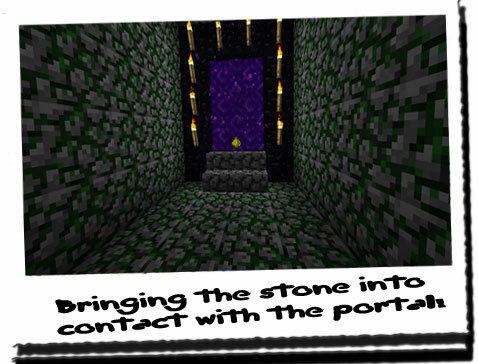 As with the other portals, a series of torches had been placed around the outside of the portal, framing the rift. Stepping forward, slightly uneasy and confused as to what to do, I did the only thing that I could think of, and placed the stone on the base of the portal. I backed off, assuming the reaction would be instantaneous, but nothing happened. I waited for what seemed like minutes, but still nothing. Assuming I had done something wrong, I walked back up to it to remove the stone, but before I could, the light of the yellow stone began to dim and the brilliant purple of the portal began to discolour! The yellow light leached into the purple rift, turning it a horrid green colour! The rift then began to convulse backwards and forwards from within the frame of the portal, and it seemed like the space around it had begun to distort. The sides of the portal began to crack and splinter, and lean inwards towards the rift. The echoey dripping noise that had once resonated throughout the chamber turned into the sounds of a forceful gale, as the portal continued to crumble inwards! As I watched the sickly green rift started ti shrink, pulling the obsidian frame with it! 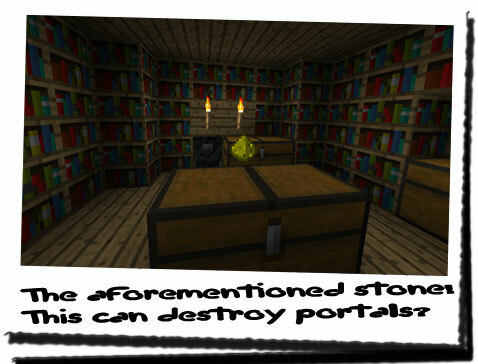 In a matter of seconds, where once stood a huge, active portal, stood nothing but bare mossy walls, the cobblestone steps and a few torches littering the floor! 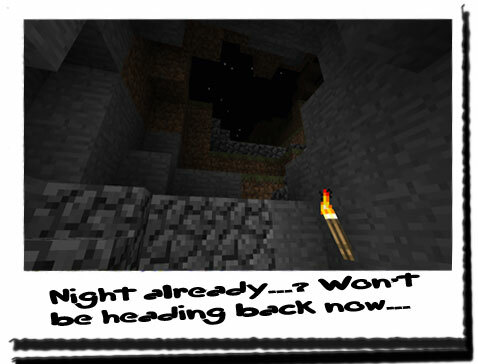 As I continued my way out, I noticed that it was night... Had I been down here that long? Slightly confused, I continued back to the house... I wasn't heading back home today! I've left the stone in my bag which I had left behind when I went to get it initially. I was thinking of dusting off the bed, but thinking more of my allergy, I decided it would be best on the floor in the sleeping bag... I had boarded up some of the windows which had been smashed, and secured the door to make sure I was safe! I'm not going anywhere tonight, so I'm settling down for the night... I can make quick headway tomorrow if I set off early, and maybe destroy the other portal if I'm lucky! I think I'll read through Jonas' notebooks he wrote... There might be parts of a diary amongst them!